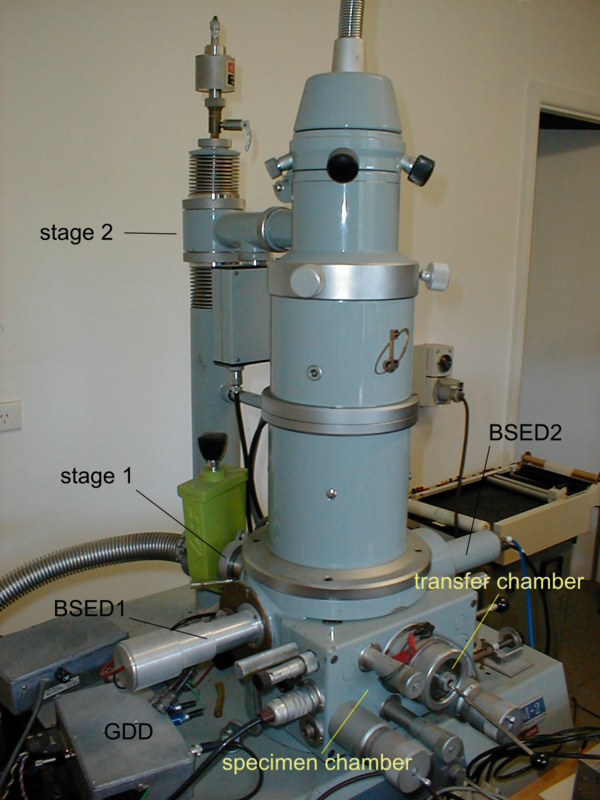 DESCRIPTION: Original ESEM prototype in Sydney: Electron optics column with differential pumping stage 1 and stage 2, specimen chamber, transfer chamber, two symmetrical backscattered electron detectors, gaseous detection device (GDD) electronics with multiple electrode wiring. 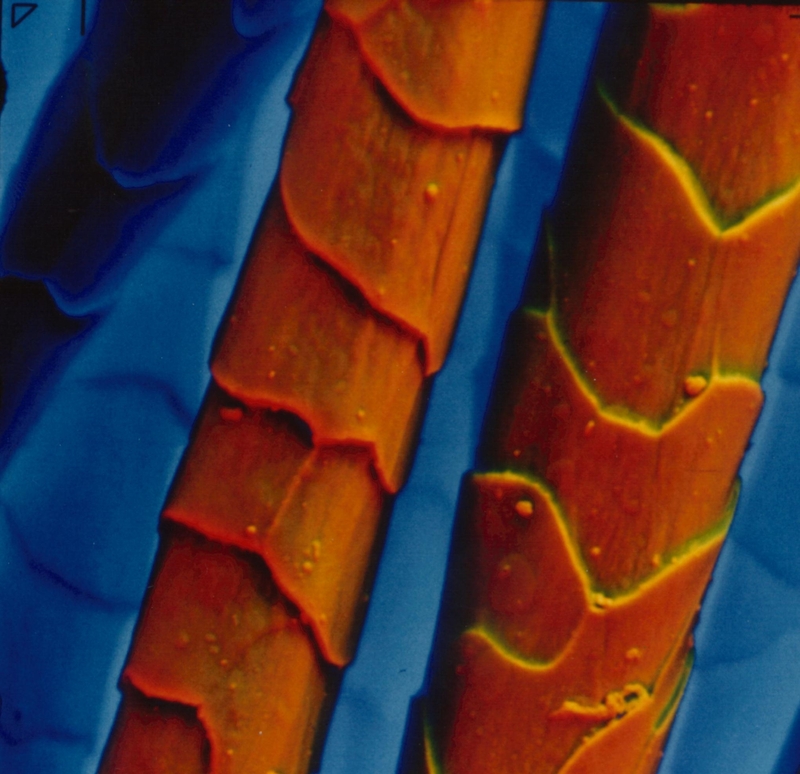 DESCRIPTION: Wool fibers imaged in an ESEM by the use of two (A and B) symmetrical plastic scintillating backscattered electron detectors: Color was obtained by superimposing three images, namely, A+B, A-B and B-A through red, green and blue filters, resulting in sharp topographic contrast with illumination from the two detector directions. 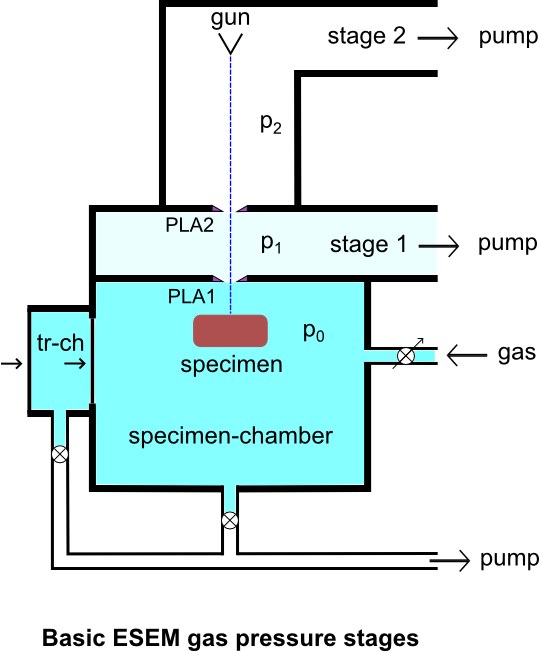 Field width=200 microns, 10 kV, 50 pA, 100 Pa pressure. 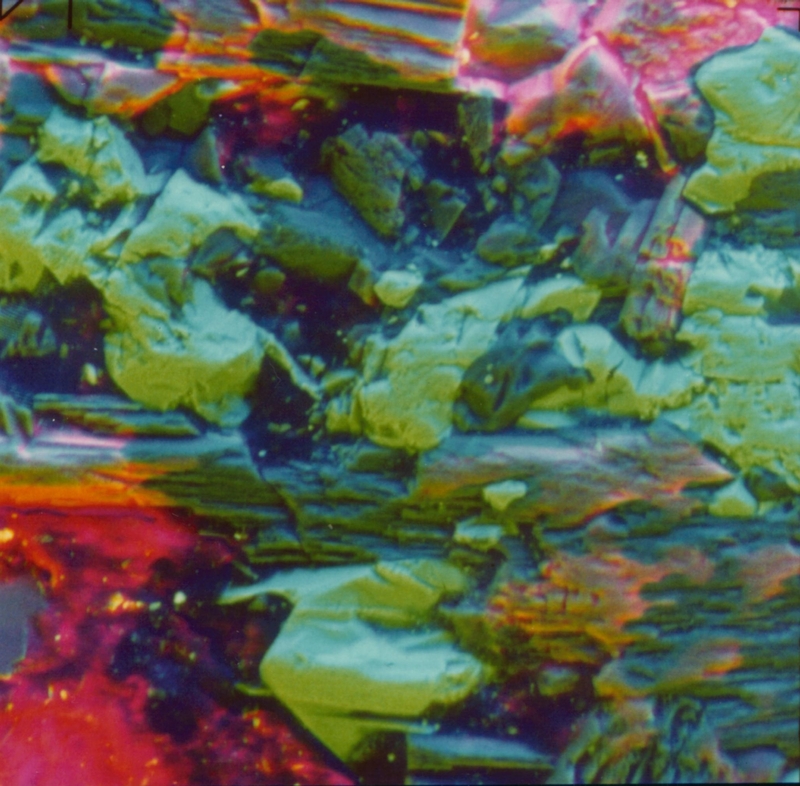 DESCRIPTION: Aluminium/iron/silicon mineral with other impurities and surface contaminants imaged in an ESEM by the use of two (A and B) symmetrical plastic scintillating backscattered electron detectors and the gaseous detector device (GDD): Color was obtained by superimposing three images, namely, A+B, A-B and GDD through red, green and blue filters, resulting in sharp topographic and material contrast. 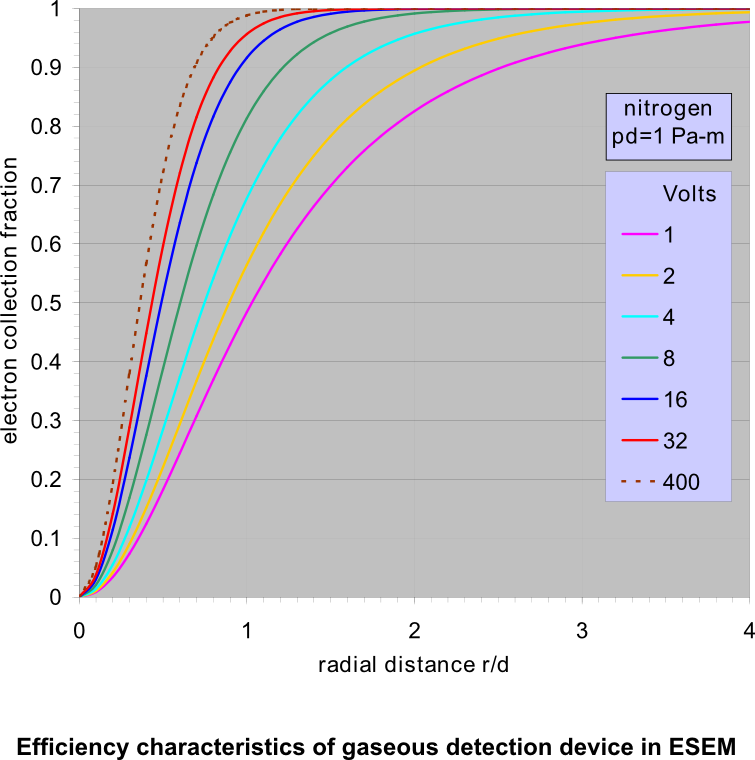 Field width=93 microns, 10 kV, 200 pA, 10 Pa pressure. 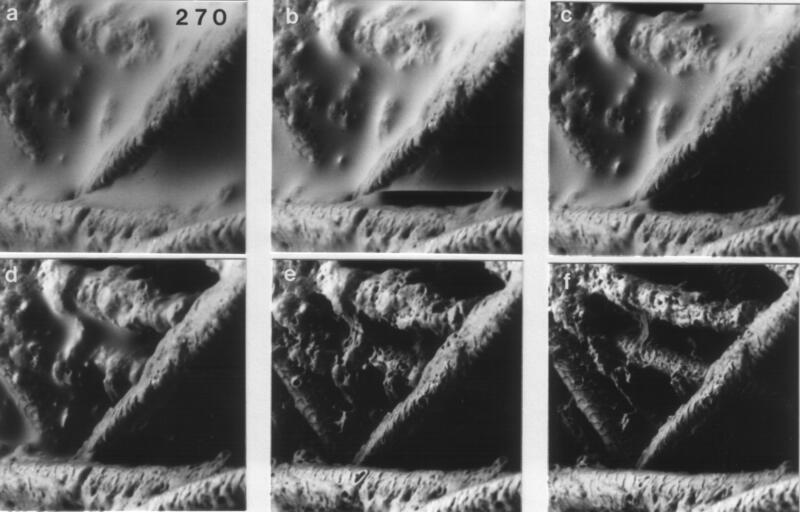 DESCRIPTION: Hydration of NaCl salt crystals on Teflon, as water vapor pressure rises, at room temperature, in an ESEM by the use of two symmetrical plastic scintillating backscattered electron detectors. 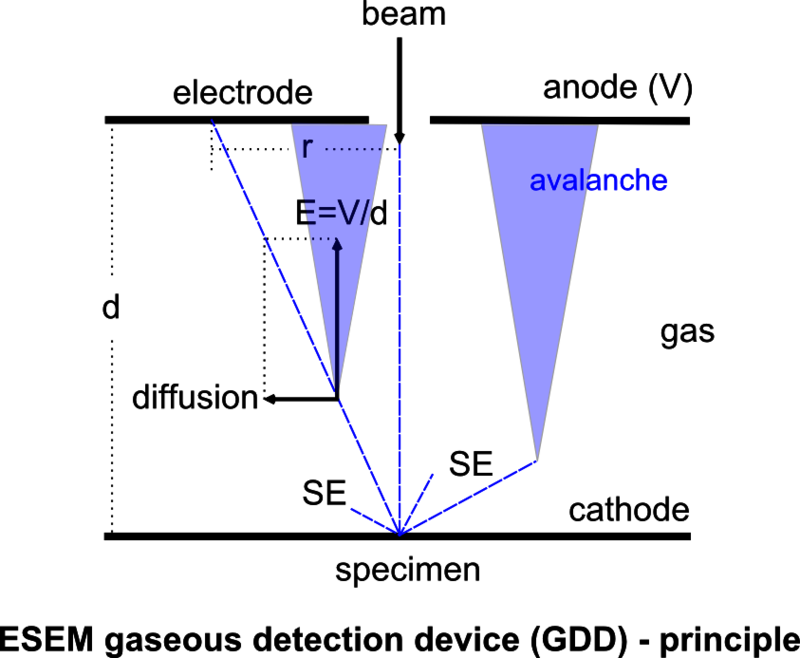 Field width=300 microns, 10 kV. 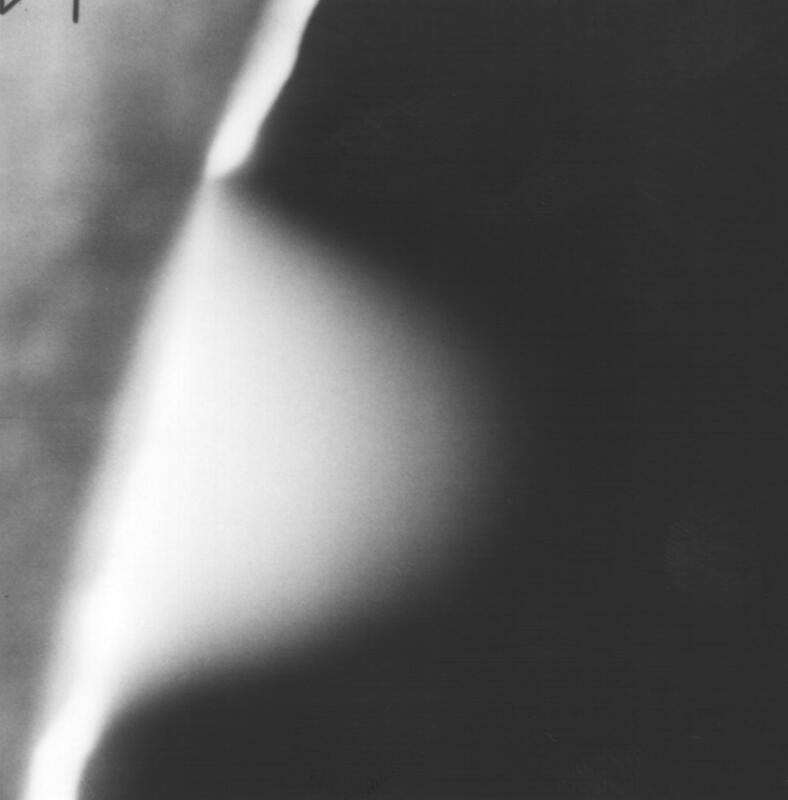 DESCRIPTION: ir gas jet through 100 micron aperture into ESEM chamber held at 200 Pa, image taken with gaseousdetection device, 15 kV. 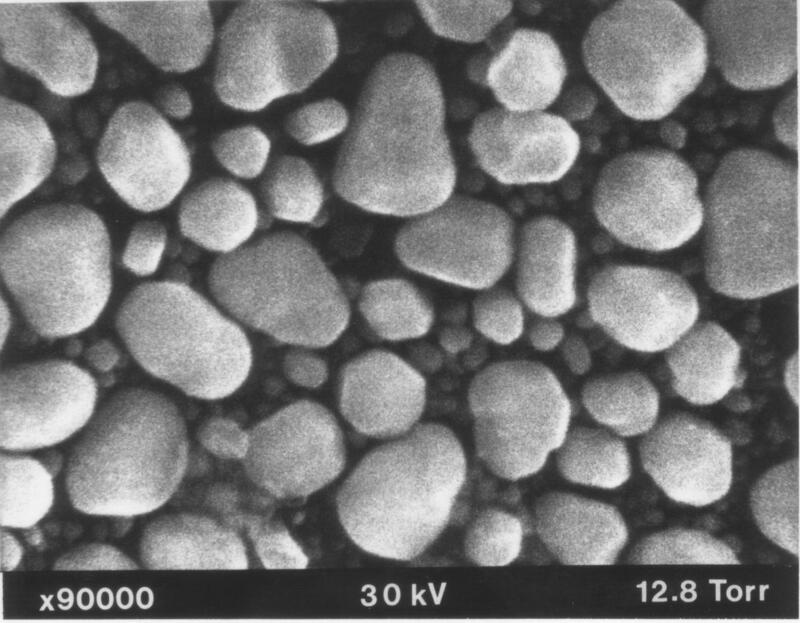 DESCRIPTION: Resolution test specimen of gold particles on carbon in ESEM, at high magnification. 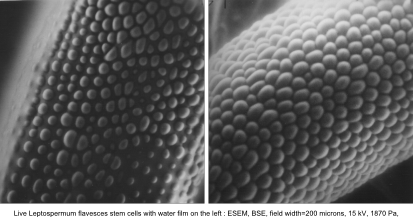 Field width= 1.2 microns. 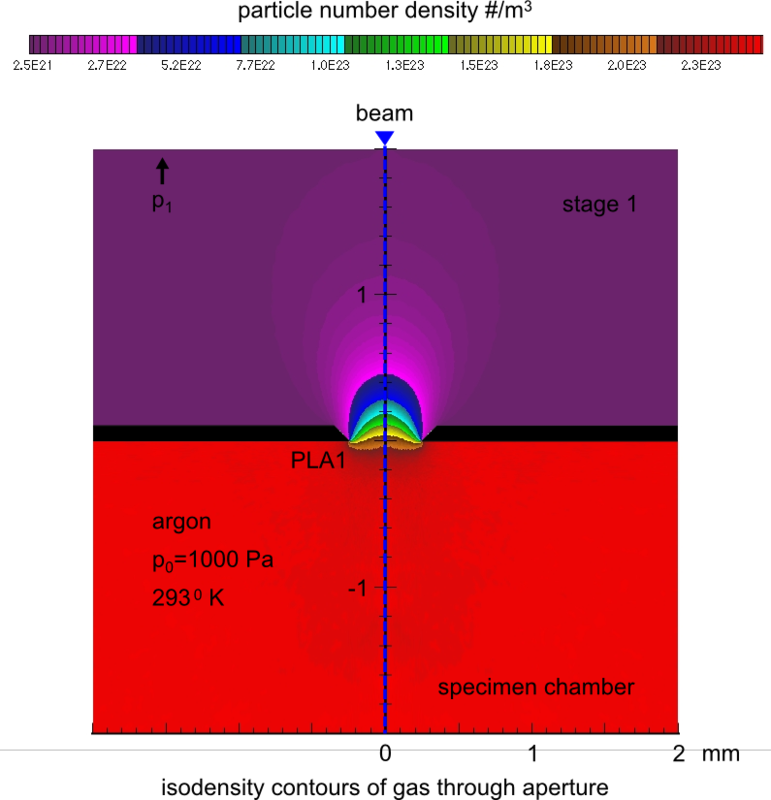 DESCRIPTION: Greasy wool fibers going from wet to dry in ESEM. 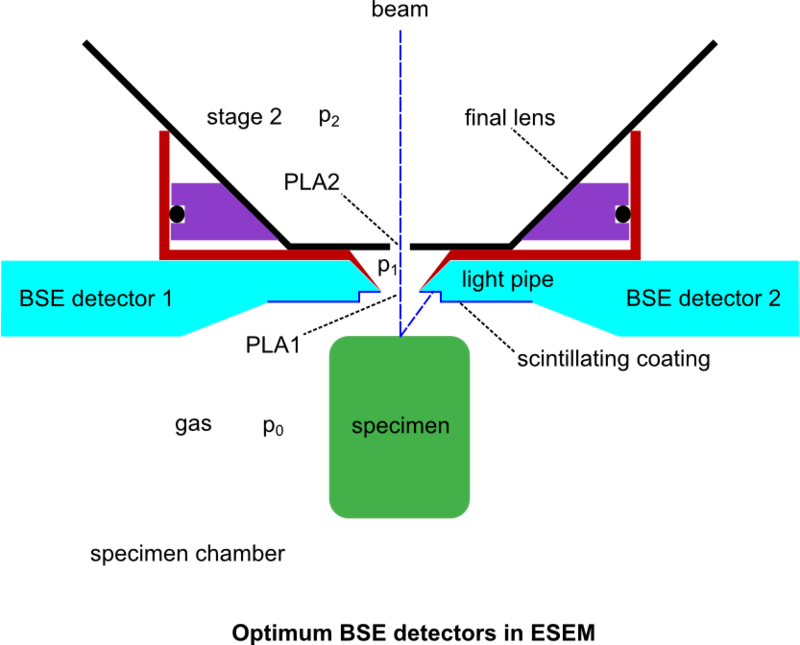 Field width= 270microns, BSE, 10 kV.